Forget the protein shakes, chocolate milk may be the best thing to drink after you workout. Scientists have found that the beverage has all the nutrients that your body needs to replenish itself from exercising. The protein helps the muscles recover and the calories replace those burned when you are on the treadmill. 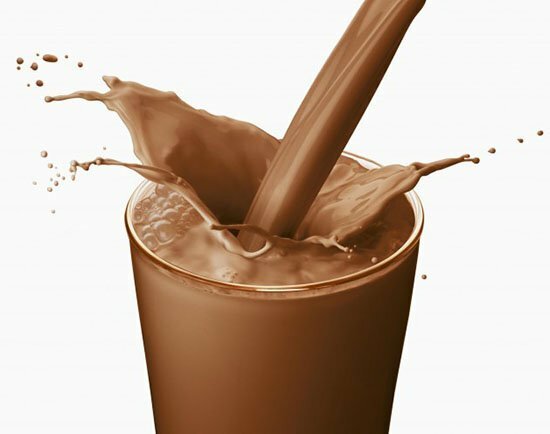 Researchers said that chocolate milk, so long as it was a low fat brand, was the ‘gold standard for a recovery beverage’. The finding calls into question the popularity of protein shakes, which were once used by bodybuilders but are now consumed by ordinary people who believe they make them stronger. As a result the ‘sport-related’ protein product industry is booming and by 2017 we will be eating and drinking £8bn a year of bars, drinks, and other supplements. According to Cornell University, however, chocolate milk does just as good a job – if not better. They sought out the best post-exercise beverage after seeing athletes overeating at night to compensate for their tough training regimes. The team used computer software to develop a formula for the best product and combined it with advice from nutrition specialists in the athletic department. The researchers tried adding Omega 3, the health fatty acid, into the drink but it increased the fat content too much. They also tried adding more sugar but realized that may cause stomach problems. Clint Wattenberg, the coordinator of sports nutrition at Cornell, said that after numerous experiments they settled on an eight-ounce bottle of chocolate milk similar to those served with school lunches. Their modified chocolate milk contains 16 grams of protein and 230 calories per eight-ounce serving. By contrast a regular bottle of chocolate milk similar has eight grams of protein and 160 calories. Mr. Wattenberg said that 20 grams of protein is optimal for muscle recovery for an athlete weighing around 10 stone. A 20 stone rugby player with greater muscle mass might need around 30 to 35 grams of protein, which could be topped up with chocolate bars or other foods. Mr. Wattenberg, a former wrestler, said: ‘The composition of low-fat chocolate milk is probably the gold standard for a recovery beverage. ‘We don’t have to second-guess where this supplement is coming from’. According to the NHS, men and women should aim for 50g of protein a day and most adults get more than enough from regular meals. The beverage, called Big Red Refuel, is now being manufactured by the Cornell on-site dairy and is available on the university campus.